Parents who seek to engage the minds and fingers of their curious four to eight year olds should consider adding Okido’s latest picture book to their child’s collection. 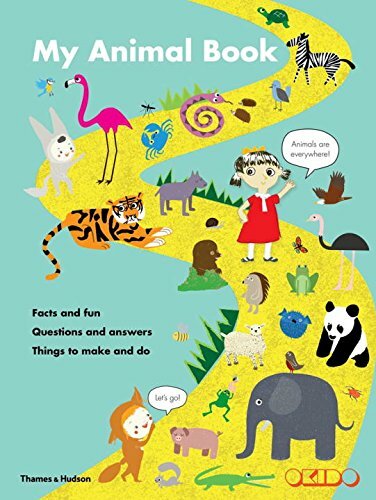 My Animal Book: Facts and Fun Questions and Answers, Things to Make and Do is a combination fact book, puzzle book, and game and activity book. Children learn what animals are, what they do all day, how to identify their families, and how to explore their animal worlds. When children need a break from the facts, they can turn the pages and learn how to make paper animals or how to construct flipbooks. They can explore the ocean or the Amazon rainforest, or they can get a close up view of how animals like the spider and snake lay traps. They can even try their hand at making animal pancakes. The book is filled to the brim with colorful, kid-friendly illustrations of an endless parade of all things animal. If there is any negative (and that’s a big “IF”), it is that this book is busy almost to the point of distraction. On the other hand, children this age typically pose dozens of “What?” and “Why?” questions every day, and this big book is perfect for answering many of those questions.